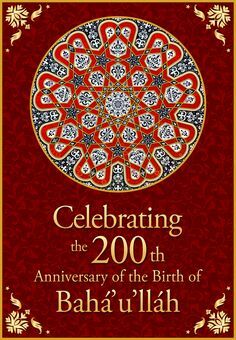 games | bahá'í children's class ideas! games for use with Bahá’í children’s classes. A relay race is a good way to help children understand how the Covenant operates, as it illustrates the idea of successorship—one person comes after another. If the classroom is too small for children to run around, this activity can take place outdoors or in a gymnasium. Explain to the children that they will be carrying the torch of the Covenant in order to carry forward the religion of God, from its beginning to the present day. The “torch” can be a baton or stick, or a creatively decorated Olympic-style torch that has been prepared beforehand. Arrange all the children in the class along a path that begins at one end of the classroom and ends at the other. If many children are present, the path can curve around or go back and forth across the room; each child should be able to run for at least four to five seconds. The race will proceed from one end of the path to the other, with each child passing the torch to the next child in line, similar to a relay race. If the torch is dropped, the child who dropped it must pick it up and take it to the next person in line. The goal is to bring the torch all the way along the path in as little time possible, without straying from the path or dropping the torch. If anyone drops the torch, the race starts over from the beginning. This variation is best used when there is ample time and a relatively small number of participants. 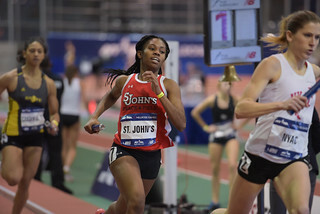 Photo: 2015 Millrose Games – Armory – Women’s Club Distance Medley Relay, by Steven Pisano (CC BY). 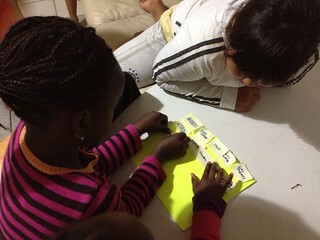 “The Shark Game” is just one variation of the game “Sharing”, found in Lesson 3 of Grade 1 of the Ruhi Book 3 curriculum. An object such as a tire or a small rug or mat is placed on the ground, representing a boat. On the count of three, as many children as possible try to stand on the “boat” together without falling off. If any of the children fall off, the group must start over again, until they are able to stand all together on the boat. To make the game a little more challenging, a blanket, towel or newspaper can be used—something that can be folded up. In the first round, the children can stand together quite easily on the unfolded blanket. With each round, though, the blanket is folded so that it decreases in size, until it’s barely large enough for all the children to stand on. The game then ends when the blanket becomes too small for the children to stand on together. Photo: Sharks! @#U%$^%#$%^#, by Ryan Espanto. CC BY. 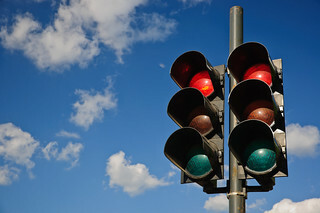 Red Light, Green Light is a popular children’s game played in different ways around the world. Here’s the way we play it. All players line up along one end of the playing field, and one person is chosen to be “it”. That person goes to the opposite end of the playing field, and faces away from the other players. The game begins when “it” calls out “Green light!” The players then run as fast as they can towards “it.” At any time, “it” can face the players, calling out “Red light,” and the others must freeze in place. If anyone fails to stop, they must return to the starting line. The first player to reach the person who is “it” wins and becomes “it” for the next round. Call out different colours that correspond to different actions. For example, “it” may call out “Yellow light!” to make all the other players walk instead of running, “Purple light!” to make them hop on one foot, and so on. Team-building version: If anyone moves when “it” calls out “Red light”, all players return to the starting line, not just the one who moved. The classic game of “telephone” is a fun addition to any children’s class, and it can be played in many different ways. Gameplay is simple: The entire class should be sitting in a circle. One person is picked to choose a starting message, which he or she then whispers to the next person in the circle; the message is then passed through the entire circle, until the last player announces the message to the entire group. Errors inevitably accumulate with each retelling, so the message usually ends up being quite different than the way it started. This game is especially useful in lessons on avoiding gossip and backbiting, as it helps demonstrate how gossip tends to alter and pervert the truth of a situation as it spreads, with details of a story changing, becoming exaggerated or even completely untrue. It also helps young children to moderate their voices, by forcing them to whisper instead of speaking loudly. Touch telephone: This variation is touch-based, rather than sound-based. The first player chooses a simple, but easily distinguishable object as the message, which he or she then draws on the back of the next person in the circle. Each person does the same in turn, drawing what they felt on the next person’s back. The last person in the circle is then given a piece of paper, and draws what he or she felt. Some good objects to try could be a fish, a house, a flower, a sailboat, a star, or a letter of the alphabet. 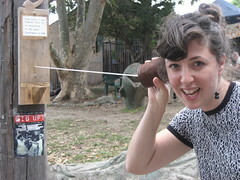 Photo: “lucia & the tin-can phone“, by Somaya Langley. Here’s a cooperative game we came up with to help our children think about helping to clean up around the house, in the context of a lesson on cleanliness. 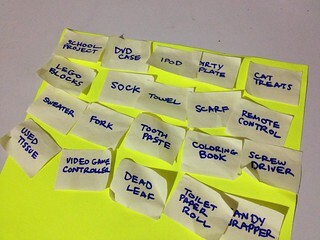 On a set of post-it notes, come up with a good number of things you might find laying around a home. About 15 or 20 things should be fine. 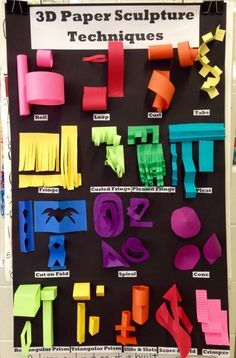 Stick all of the post-it notes onto a sheet of paper and present them to the children. One by one, the children must pick one post-it note and stick it on the door of the room where the thing it represents should be put away. For example, a sock goes in the dresser, which is usually in the bedroom, so the post-it note would go on the door to the bedroom; a broom would go in the broom closet; a TV remote control would go in the living room; and so on. If the class is not being held in a home, different “stations” can be set up around the classroom to represent the different rooms of a home. You can also include some “garbage” items that should be placed in the trash, or “recyclable” items that should be recycled, or even “reusable” items, depending on your preference. Once all the post-it notes have been placed, inspect them to make sure all are placed properly. Once this is done, gather them all up again and place them back on the paper. Next repeat the exercise once more, but instead of having the children come up one by one to pick a post-it note, ask them to divide them evenly amongst themselves, and have them go all at once to place them where they should go. Once this second round is done, inspect them again to make sure all are placed properly, and gather them up again once done. Finally, ask the children to reflect on the exercise. How long did it take to put everything away when placing the post-it notes one by one? How long did it take when everyone placed their notes at the same time? What about when we clean the classroom, or our room, or our house? Does it take longer when we work alone, or when we work together? Strips of paper are hidden throughout the class, with different qualities written on each of them: some good, some bad. The participants must ignore the strips with “bad” qualities written on them, and bring back the ones with “good” qualities. They can’t pick up just any strip of paper; they have to read it and analyze whether it’s worth bringing back. In that way, we demonstrate how to “overlook” the faults of others—which, itself, happens to be one of the “good” qualities they must find.